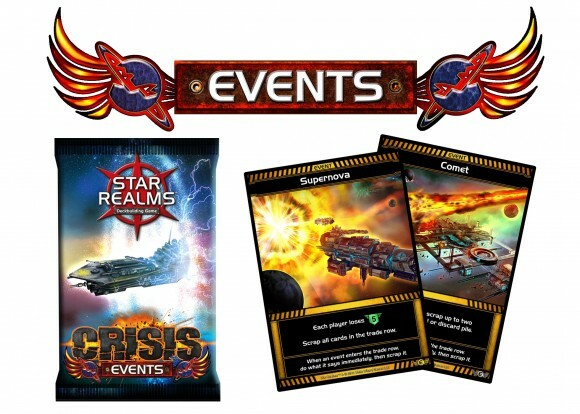 The Star Realms universe is in crisis, will you rise to the challenge? 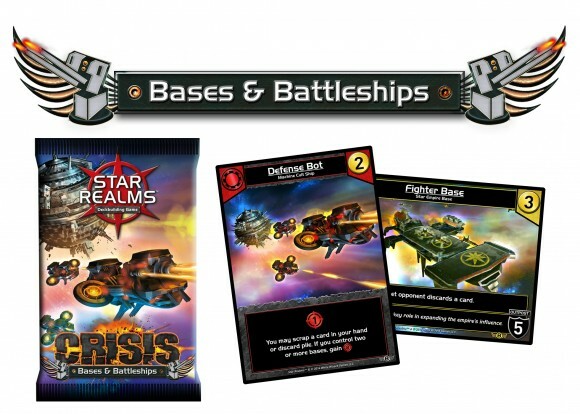 This explosive new expansion features four new packs of cards to expand your Star Realms play experience: Events, Heroes, Fleets & Fortresses and Bases & Battleships. Add awesome new ships and bases to your Trade Deck, plus experience Heroes and Events for the first time! The never-ending war for galactic supremacy has given rise to bold new ships and powerful new bases. The Bases and Battleships pack provides you with eight new ships and bases for your Trade Deck. The Machine Cult can bounce bases with the Mega Mech and the Star Empire can lock down your opponent’s hand with a Fighter Base. This pack contains 12 cards: 1 Construction Hauler, 2 Defense Bots, 2 Fighter Bases, 1 Imperial Trader, 1 Mega Mech, 1 Obliterator, 2 Trade Rafts and 2 Trade Wheels. Space is home to a multitude of epic events and cosmic phenomena. Even the mightiest of starships seem insignificant in the face of Supernovas, Black Holes and Comets. Events are a new type of card for your Trade Deck. Each Event card has a potentially game changing effect as soon as the card enters the Trade Row. After it has its effect, it immediately gets replaced with the next card in the Trade Deck. This pack contains 12 cards: 1 Black Hole, 1 Bombardment, 2 Comets, 1 Galactic Summit, 2 Quasar, 1 Supernova, 2 Trade Missions and 2 Warp Jumps. Heroes are forged in times of crisis. The fate of empires can turn on the actions of a single individual. Heroes are a new type of card for your Trade Deck. When you acquire a Hero, it goes directly into play instead of into your discard pile. Then the Hero awaits your command to rally their allies and give your turn a boost. 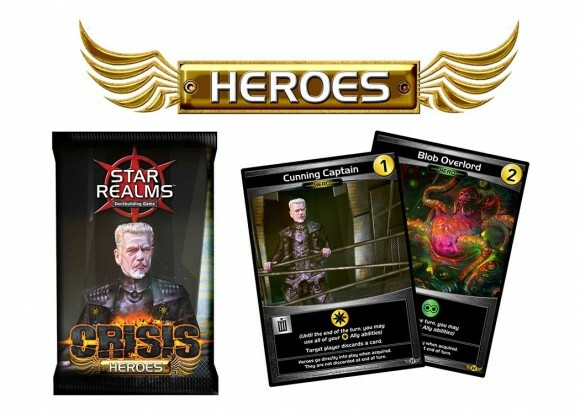 This pack contains 12 cards: 2 Cunning Captain, 1 Admiral Rasmussen, 2 Ram Pilot, 1 Blob Overlord, 2 War Elder, 1 High Priest Lyle, 2 Special Ops Director and 1 CEO Torres. The engines of death and destruction are constantly evolving to keep up with the cries for victory. 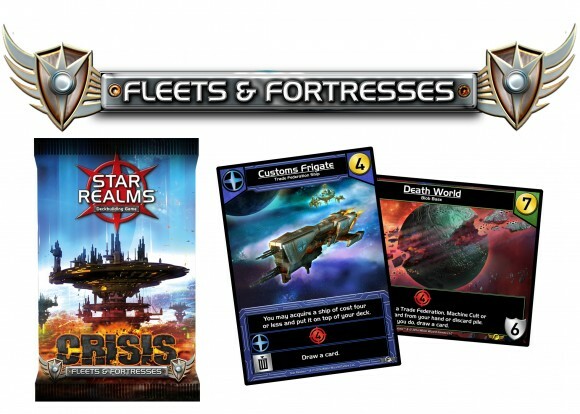 The Fleets and Fortresses pack introduces eight new ships and bases for your Trade Deck. These range from Spike Pod: an aggressive and useful new one cost ship for the Blobs, to Capitol World: a powerful new eight cost base for the Trade Federation. 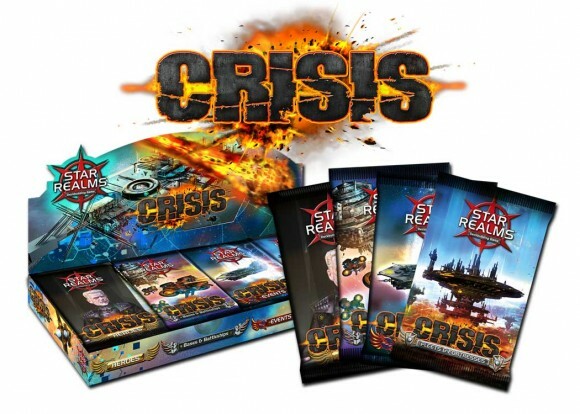 Add a Review for "Star Realms: Crisis"